Becoming (or building) a simple church requires four things: Clarity, Movement, Alignment, and Focus. The process of discipleship must be clear for leaders, members, and even new attenders. “Clarity is the ability of the process to be communicated and understood by the people.” (p. 111) In your church, is there an easily-understood (and easily-undertaken) pathway to maturity? Or are there unnecessary roadblocks (like an overwhelming amount of programs, lack of communication, etc.) to becoming mature in Christ? The process of discipleship must be clear for leaders, members, and even new attenders. If there are roadblocks to maturity, people will not purposefully move from new believer to committed disciple. “Movement is the sequential steps in the process that causes people to move to greater areas of commitment.” (p. 139) One of the primary tasks of church leaders and pastors is to help people move into the stream of God’s transforming work. All staff, and all ministry departments, should be aligned toward the same goal. “Alignment is the arrangement of all ministries and staff around the same simple process.” (p. 168) Whatever process for discipleship God gives your church, the leaders and staff must all be on board. Making disciples should be the same process for children as it is for students and adults. This demands discipline and focus from everyone, especially senior leadership. “Focus is the commitment to abandon everything that falls outside of the simple ministry process.” (p. 203) This is the hard part – where the rubber meets the road for church leaders. Staying focused is going to require saying “No” to a lot of people and programs. There are a lot of good things that churches can do, but doing too much takes time and resources away from the main thing, which is to make disciples of Jesus Christ. A simple church doesn’t confuse or overwhelm people with ministry programs and events. Instead, it helps people through a clear process of becoming like Christ. This was repeated at the beginning of every chapter, and it has been tremendously helpful to me as our church plant team thinks about how Hope Church will operate. One of our core values is Simplicity, meaning we don’t want to be a church bogged down by programs that wear out our staff and overburden our leaders. But what I’ve discovered through this book is that simplicity is also clarity. 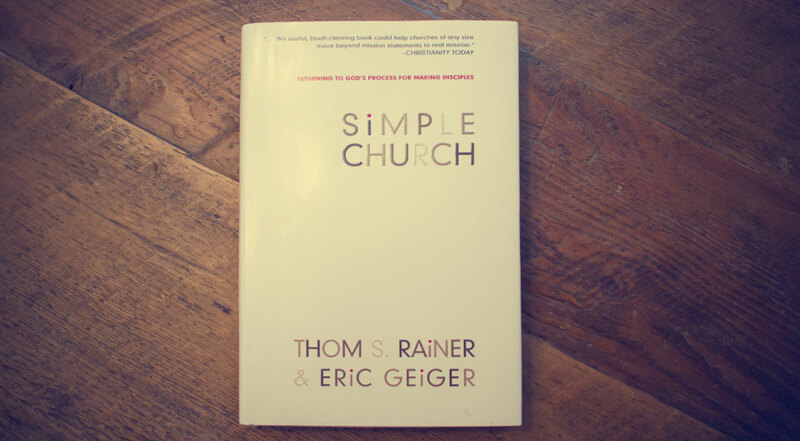 It’s not that a simple church has fewer programs than other churches (it typically does), it’s that it has a clearly-defined process to which it strictly adheres. A simple church doesn’t confuse or overwhelm people with ministry programs and events. Instead, it helps people through a clear process of becoming like Christ. The example of “Cross Church” in chapter 2 was very helpful for me. Their purpose statement was “Love God, love others, and serve the world.” Everything they did revolved around these three things. Sunday morning services were about loving God. Small groups were about loving others. Ministry teams were about serving the world. That was all they did, and all of their ministries (Children’s, Youth) shared this process. Love God. Love others. Serve the world. It’s a purpose and a process. This was eye-opening to me, and has really gotten me thinking about how we might do things at Hope Church. As you might imagine, this is a very simple book. It doesn’t give a new church model, but rather a new (or possibly ancient) church philosophy. The philosophy of developing and maintaining a simple disciple-making process makes a lot of sense to me. Clarity is often the difference between mediocrity and excellence. I don’t want to be a mediocre pastor, and I don’t want the people I love to flounder spiritually. I believe that being simple and staying focused will help people become more deeply committed disciples of Jesus. Any church leader, and especially pastors and elders, would benefit from reading this book.